The 95% certainty is itself problematic, because it is a very high level summary of lots of different details…if you pick the science apart there are some areas where we are much more certain than that, and there are other areas where there is a lot uncertainty…the basics of how the greenhouse effect works and then what happens if you add more carbon dioxide to the atmosphere – that’s not 95% certain, that’s 100% certain. It’s a stable piece of science that’s been around more than 100 years. 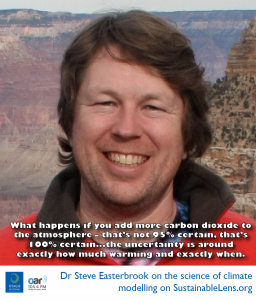 Dr Steve Easterbrook studies contributions of computing and software to the challenge of dealing with climate change at the University of Toronto. 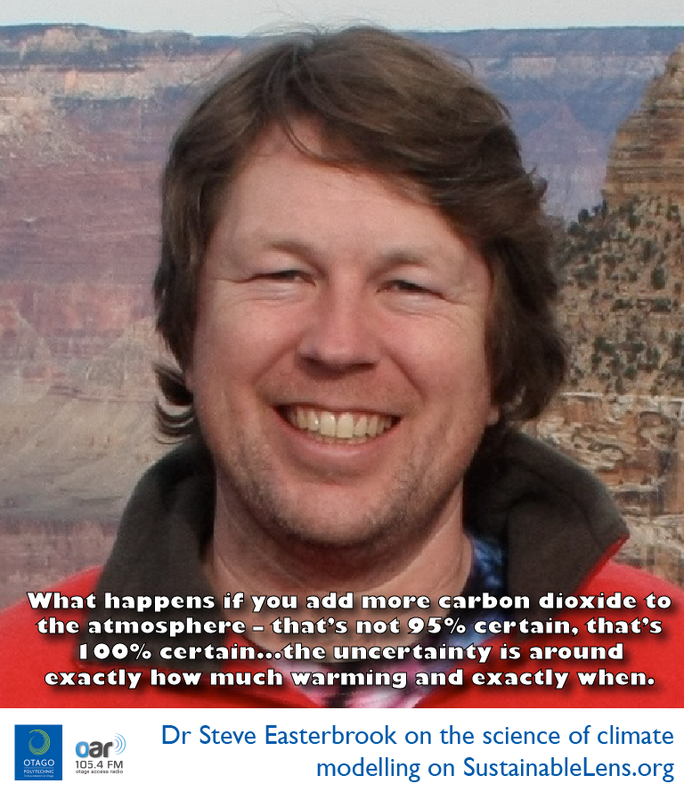 His focus is on climate informatics, in particular, how climate scientists develop computational models to improve their understanding of earth systems and climate change. Large complex pieces of software that have been built over many many years by large teams of people. Each climate model is something like a million lines of code, that has taken 10-20 years to build…and there are around 25 models being built around the world…and they take different approaches. Each is building coupled systems, they sometimes swap parts. Contributing to the models is a long slow peer-reviewed process. What surprised me the most, I thought the models are for predicting the future – that’s what we see in the media, we see these projections of climate change over the coming century…I thought these people were essentially futurologists, how is this going to play out in the medium and long term…but it turns out they build the models to do experiments…comparing how well the model performs with observational data of recent past or even the distant past. How they do experiments, they might have an area in the model that they know is weak, that it doesn’t match the observational data very well..so they’ll set this up as a formal experiment, they’ll create a hypothesis that says “here’s a way of improving the model by changing the way it simulates a particular part of the process”…so the hypothesis is that changing model the will improve how it simulates a particular part of the climate….my favourite example is getting the Indian Monsoons right…they run these as experiments with the existing model as the control, then go through a peer review to get the change included in the model…so on a day to day basis, almost everything they do is set up as an experiment. With a faster machine they increase the resolution, each simulation takes two weeks. For some scientists the broader politicisation is very frustrating, they want to keep their heads down…they’re not trained to communicate their work to wider audiences. The other reaction is people that want to get out and give their side of the story because they feel the media does a very poor job at representing the science and what the scientists do. The science is unbelievably complicated. There’s an asymmetry, saying “it’s all bunkum” or more subtly “we’re not sure enough, there’s too many uncertainties, we shouldn’t take action yet”…that’s a very easy message to say, especially when faced with a complex science, especially when the public hears “this is a complex science, how can the scientists be that sure?”. Scientists like to become famous by overturning existing bodies of knowledge, and when a piece of science endures for 100 years or more, we’re not 95% sure, this is uncontentious science in anyway whatsoever. The broad story that if we keep on adding more carbon dioxide to the atmosphere the planet will keep on warming, there’s no doubt in the scientific community about that, the uncertainty is around exactly how much warming and exactly when will it occur. The big picture there is no doubt about, the uncertainty is about the details. The email leak has brought many of the climate scientists to the realisation that they have to do a better job of the communication, they can’t leave it to others to do because there aren’t any others..there aren’t other communities that understand the science enough to explain it. I’d like to see more telling the story of what what scientists do on a day-to-day basis in terms that other people can understand. The more you change the climate, the less you can be sure that the models are capturing it correctly. Tipping points are really hard to predict, we can see that they might be there, but making predictions about exactly when they would occur is really hard. It might be counter-productive…to put a date on climate change such as a 5 window to take action…because as the end of that window approaches you undermine your entire message, because people take from that “5 years and then disaster occurs, we’ve got to 5 years and where’s the disaster?”…the right message is climate change is already with us, and it’s causing all sorts of chaos around the world, it’s just not evenly distributed. Specific windows are a bad idea…specific goals as well, 2 degrees of warming, we’re approaching that now, or at least we’re approaching the point where we are locked into two degrees of warming…as we get closer and closer to the point of no return, what’s the message about that? well we were wrong about 2 degrees, maybe we can go to 2 and a half, maybe 3…and you are completely undermining the message about consequences when you set these thresholds -it’s an incremental change, it will occur and it is occurring at different rates and different severities around the world. Climate change is an incremental problem with a huge degree of inertia, we have to act now to affect what the world is going to be like in fifty years time, that’s really hard for people to comprehend, on the other hand, if we talk to people about making our cities cleaner, making the air cleaner, that’s a very easy message and where there are immediate impacts, so one of the things we can do around climate change is work on solutions that have those immediate benefits, but that also contribute towards the longer term problem. Climate change is the elephant in the room, no matter what we achieve in terms of sustainability, if we don’t tackle climate change then it’s going to be serious, it’s going to undermine our other efforts, but on the other hand you could turn that around, and say why don’t we build a network of sustainability initiatives that together add up to more than the sum of the parts, that add up to a solution to climate change, even though if you pick them apart and attempt to measure them…they don’t appear to add up. And that’s important because we can’t get them to add up…if you look at what the IPCC says we need to stay below 2 degrees of warming, it looks like it’s impossible. Because if you don’t start somewhere and if you don’t start building efforts that get people engaged then you won’t achieve anything so it becomes self defeating. The more I’ve worked with climate change and thinking about solutions, the more I’m tending to thinking about sustainability in it’s broader sense as opposed to direct action on climate change. Get people thinking about change first, and doing things that are new, getting used to the idea that change is necessary. A farmers market gets people talking… in terms of carbon accounting it might look like nothing, but in terms of getting people changing what they do and thinking about what other changes are needed, I think it’s massive. Joel Pett’s “What if it’s all a hoax and we create a better world for nothing” cartoon. More SustainableLens on the work of climatologists and climate models: Naomi Oreskes, Andrew Tait.